Our range of products include high speed paper cone making machine, fully automatic paper cone making machine, textile paper cone making machine, paper cone making machine and textile paper bobbin making machine. We are leading manufacturer and supplier of High Speed Paper Cone Making Machine. This machine is a fully automatic paper cone production line for the textile industry. It is controlled by PLC. We are engaged in offering our clients a superior quality range of Fully Automatic Paper Cone Making Machine. It consists of paper cone winding unit, drying oven, and paper cone finishing the unit. We hold expertise in offering the wide gamut of Textile Paper Cone Making Machine. 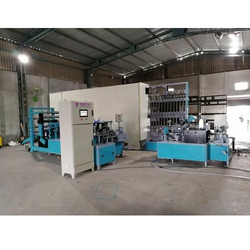 This machine is a fully automatic paper cone production line for the textile industry. Our firm offers a high-quality range of Paper Cone Making Machine. This machine is a fully automatic paper cone production line for the textile industry. Our firm is involved in manufacturing and supplying a huge range of Textile Paper Bobbin Making Machine.